International business travel is more complicated than a domestic flight across the country. Overseas trips require special attention to planning, packing, and flying. By working with a business travel agency, you’ll feel fully prepared for the trip and its unique nuances. Here are a few factors to keep in mind before, during, and after an international flight. With terrorism on the rise, entry into another country is stricter than ever. Plan ahead, and secure all necessary documentation to avoid delays upon landing and the customs process. Of course, you’ll bring your passports and/or visa, but it’s also important to keep digital records of them. Scan the documents and email them to yourself, friends, and family. Give someone back home access to these vital credentials, as well as your itinerary. Another factor to plan for is the time change and accompanying jet lag. The more time zones you cross, the more intense your jet lag will be. Though its side effects are inevitable, get as much sleep as you can in the nights leading up to your trip to minimize the impact. Some anxious flyers ask for an alcoholic drink the moment they sit down in attempt to calm their nerves and help them sleep. A beverage can be tempting, but it can also work against your body trying to sleep. If you struggle with sleeping on long flights, skip the cocktail, and consider taking an over-the-counter or natural sleep aid. However, it’s not recommended to try a sleep aid for the first time while flying abroad. The side effects vary greatly for everyone. Melatonin is the most natural sleep aid, but if you need something a little stronger, try Tylenol PM or Benadryl. One thing’s for sure: a long flight is not the time to experiment. Your health may be in trouble if you remain sitting for hours on end. On a long, international flights, keep your blood flowing by standing up for an occasional stretch. Additional space is usually found near exit rows and by the restrooms. Don’t go empty handed — bring a book or tablet to keep you preoccupied. Before landing, you’ll be asked to complete a landing card supplied by your airline. Roughly twenty minutes before your arrival, the pilot will request you complete this to legally enter the country. You’ll take this document with you to the immigration check point. When you land and everyone starts unbuckling their seat belts, run through a mental checklist of what items you brought onboard. To make matters easier, jot down a note of all your luggage before takeoff. Upon landing, double check under the chair in front of you and the seatback pocket for any small items you may have pulled out in flight. Don’t forget your landing card! Even with all these tips in mind, booking an international trip can be overwhelming. 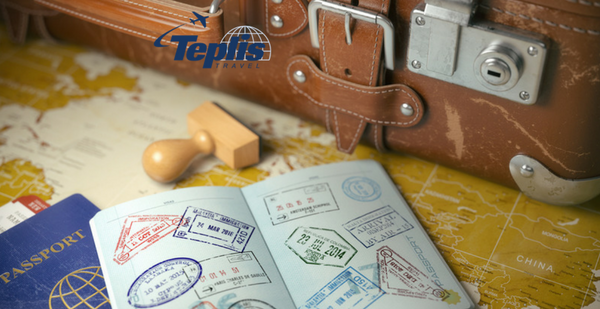 That’s why you should work with Teplis, a corporate travel agency with over forty years of experience. Call us today at 1-800-669-6547 to speak to an experienced representative about your next international business trip.